The practice of making New Year’s resolutions goes back over 3,000 years to the ancient Babylonians. There is just something about the start of a new year that gives us the feeling of a fresh start and a new beginning. In reality, there is no difference between December 31 and January 1. Nothing mystical occurs at midnight on December 31. The Bible does not speak for or against the concept of New Year’s resolutions. However, if a Christian determines to make a New Year’s resolution, what kind of resolution should he or she make? Common New Year’s resolutions are commitments to quit smoking, to stop drinking, to manage money more wisely, and to spend more time with family. By far, the most common New Year’s resolution is to lose weight, in conjunction with exercising more and eating more healthily. These are all good goals to set. However, 1 Timothy 4:8 instructs us to keep exercise in perspective: “For physical training is of some value, but godliness has value for all things, holding promise for both the present life and the life to come.” The vast majority of New Year’s resolutions, even among Christians, are in relation to physical things. This should not be. 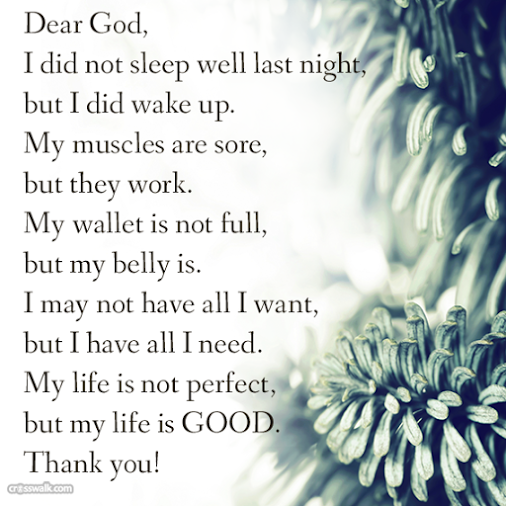 Give thanks for all of these things…. For you are truly blessed.